Home » Posts tagged "Job Description property manager"
Property Manager: Property, plant and equipment’s all are considered as an asset because of its long-term benefit whereas a manager is any person who is responsible for managing the property (assets/resources) of an individual or organization. As a property manager, he/she is responsible for many activities. 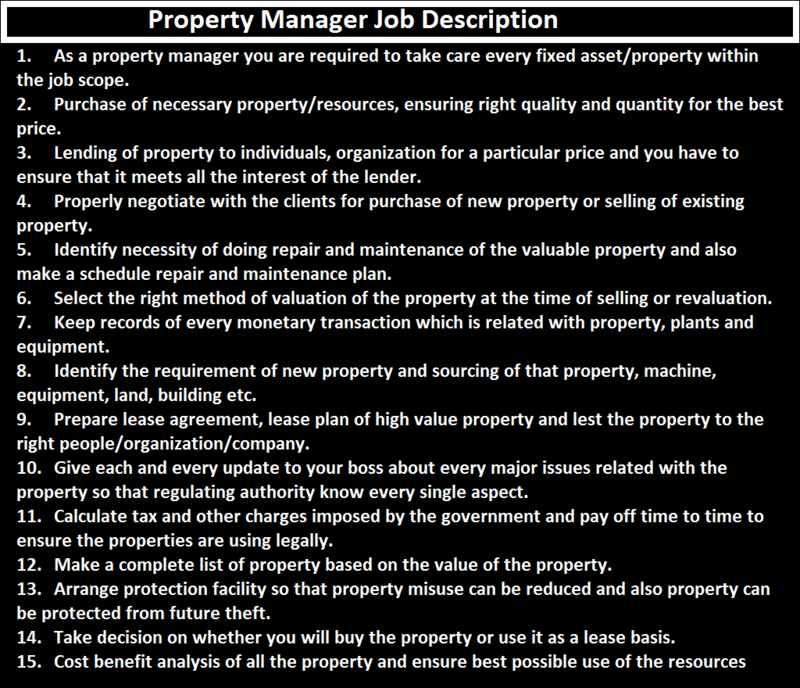 All the responsibilities of a property manager are included in a property manager job description. So whatever the responsibilities are mentioned in the job description, you need to perform as a successful property manager. Although in apparel industry property manager are not commonly seen but this kind of manager can be appointed to ensure better management and better application of valuable property and resources. As a property manager, you are required to take care of every fixed asset/property within the job scope. Purchase of necessary property/resources, ensuring the right quality and quantity for the best price. The lending of property to individuals, an organization for a particular price and you have to ensure that it meets all the interest of the lender. Properly negotiate with the clients for purchase of new property or selling of existing property. Identify the necessity of doing repair and maintenance of the valuable property and also make a scheduled repair and maintenance plan. Select the right method of valuation of the property at the time of selling or revaluation. Keep records of every monetary transaction which is related to property, plants, and equipment. Identify the requirement of new property and sourcing of that property, machine, equipment, land, building, etc. Prepare lease agreement, lease plan of the high-value property and lest the property to the right people/organization/company. Give each and every update to your boss about every major issue related to the property so that regulating authority know every single aspect. Calculate tax and other charges imposed by the government and pay off time to time to ensure the properties are using legally. Make a complete list of a property based on the value of the property. Arrange protection facility so that property misuse can be reduced and also property can be protected from future theft. Take a decision on whether you will buy the property or use it as a lease basis. Cost-benefit analysis of all the property and ensure the best possible use of the resources.